I am center in my white shirt, shown with my ‘Kokopele’ rug, Emma is on the right with her ‘Story Teller with a Border’ rug. 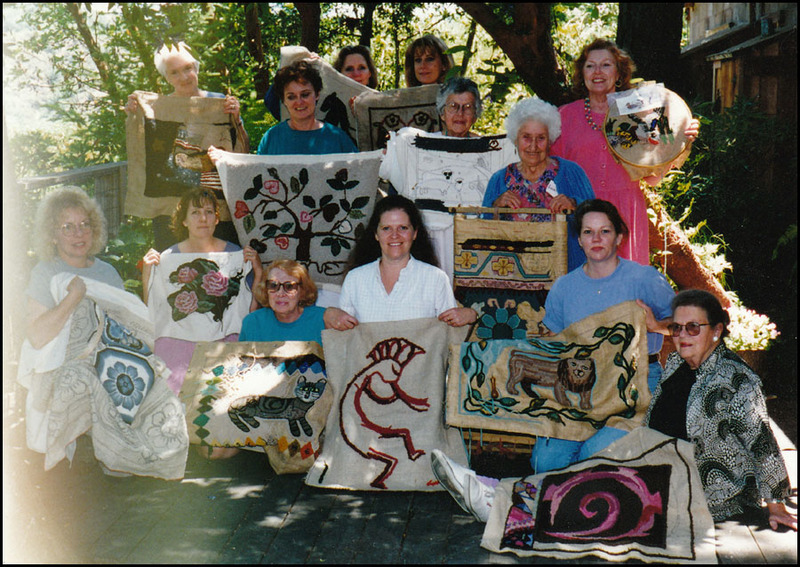 When my mother, Emma Webber, and I joined the new ATHA rug hooking guild in 1996, I learned to hook rugs. 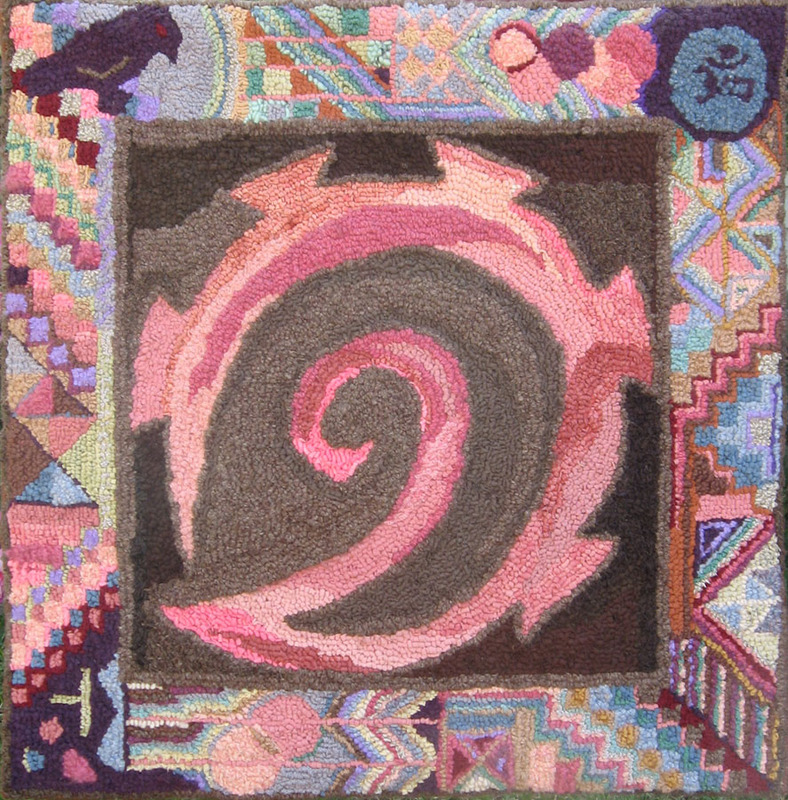 Emma had hooked rugs all of my life and I knew that I would take up the hook someday. That someday had arrived when she received an invitation to be part of this new group; the Wine Country Rug Hookers! In the beginning, we met at each other’s house; which was very interesting. We really enjoyed getting to know all these other rug hookers and being in each others’ homes added to that appreciation. I stopped calling my mother, ‘Mom’ at that time and started calling her ‘Emma’. She had indicated that she preferred to just be herself, Emma that is. As most of the other members of the Wine Country Rug Hookers were mothers, when I called out ‘Mom’, almost everyone responded. Clearly it was time to change my ways. Some people thought it was disrespectful to call my mother by her name, but it suited us fine. This is the rug Emma was working on when we joined the Wine Country Rug Hookers. Emma wouldn’t teach me the actual technique of rug hooking, since her ‘method was unorthodox’, her words. I quietly observed and listened to others in our new group. We demo’d rug hooking at the Sonoma County Fair that summer and I learned a lot more listening to Emma’s responses to the questions asked of us… ‘do you have to pull a loop up in every hole?’… ‘oh no!’ Emma answered. ‘What?’, I thought. 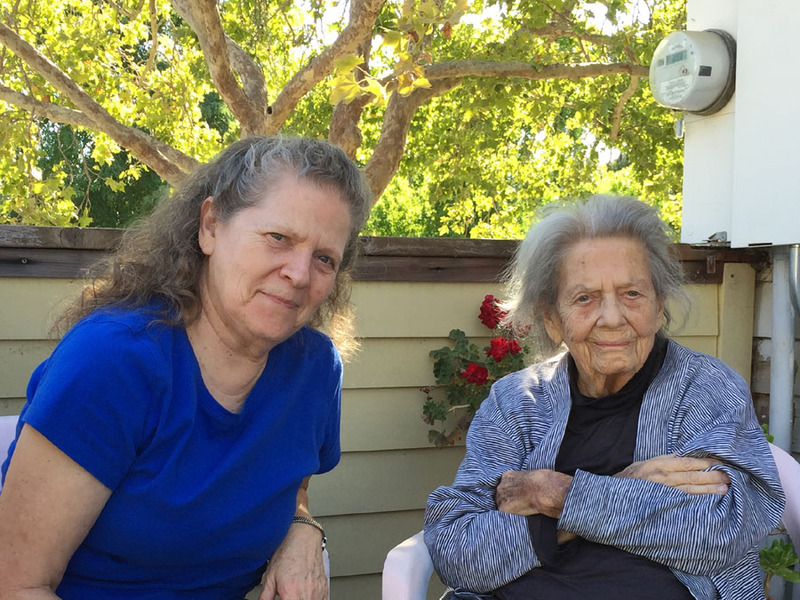 My daughter, Emma Rose, took this photo of old Em and I; our last photo together. I’m so glad we had those 19 years of rug hooking together! It is a fine legacy. Thanks Sarah. glad you stopped by my blog! I was thinking that Emma and I were not the only mother-daughter couple in Rug hooking, there have been many… it’s part of the tradition. lots of mother-daughters, lots of sisters and lots of friend sisters in rug hooking.